Clu Clu Land is an early NES title that - along with games such as Donkey Kong, Mario Bros and Pinball - epitomises Nintendo's pre Super Mario Bros. and The Legend of Zelda days. The game focuses on short and easy to understand arcade action and it's clear that Nintendo's intention with this game was to bring an arcade experience to the home, something that was commonplace during the Atari era and by extension the early days of the NES. Trying to pin down the exact genre of the game is rather difficult, it's a top-down arcade action game with unique strategy and puzzle gameplay yet it's focus is not heavy on any one particular element. 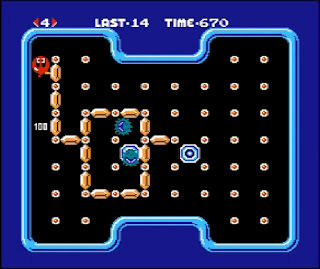 It's similar to Pac-Man in that the action takes place within a single screen wherein you must avoid enemies whilst collecting items to get a high score; yet the gameplay feels rather unique and gives the game a great sense of personality. 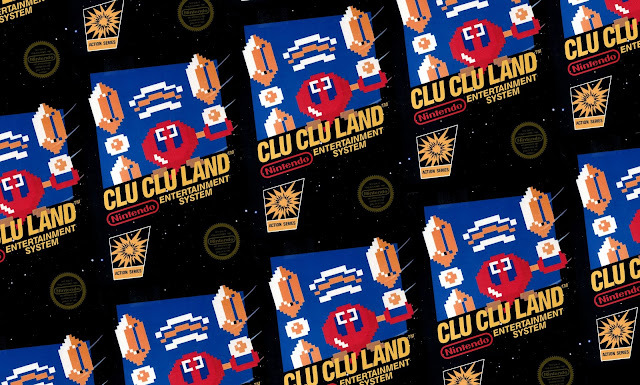 In Clu Clu Land you play as Bubbles, a generic red blob with arms and legs that is in a perpetual state of motion. The only way that she can change direction is either by hitting an outer wall - which will send her hurtling back the way she came - or grabbing onto one of the many Turnpost poles and swinging around on it. As a side note the game's original Japanese title reads as Kurukuru Rando, kuru kuru meaning to spin around and around. To spin on a Turnpost the player must extend an arm in the direction of the pole, this is done by pressing a direction on the D-pad. The controls are relative to the direction that Bubbles is facing which can be a little difficult to understand at first. 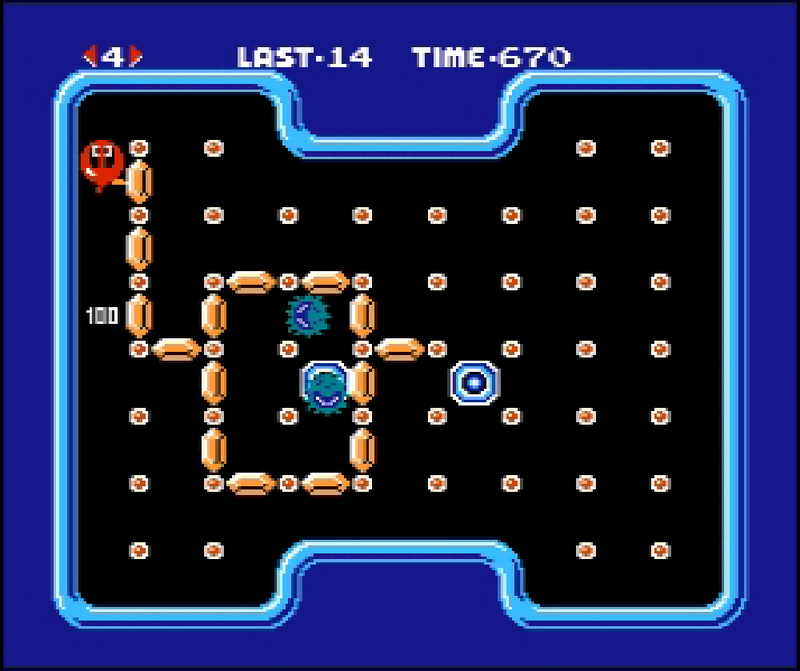 For instance, if Bubbles is moving from the right side of the screen to the left and the player wants to grab a pole that is on her left the player must press up on the control pad. This will extend Bubbles left arm and she will spin around the pole until the player lets go. 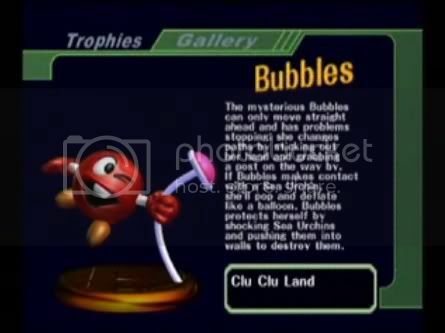 The only time that the controls mirror Bubbles' arms is when she is moving upwards. Getting to grips with the game's controls can take time and it makes you wonder if the game would be more enjoyable if left and right on the D-pad simply mirrored Bubble's left and right arms... yet once the player starts to understand the controls there is a great amount of fun and challenge to be had with the simple yet ingenious mechanic of spinning. The game is composed of five stages and a bonus stage that loop endlessly yet although there are only five stages each have four variants that are picked at random. In each stage you must guide Bubbles around the screen in order to uncover all the Gold Ingots on the stage - the sprite for these would go on to feature in The Legend of Zelda series as the Rupee. The Gold Ingots create shapes and patterns and each stage features four variants. The player won't know what version of the stage they're playing until they begin uncovering Gold Ingots. There are many elements that will make uncovering a stage's Gold Ingots difficult however, including a time limit, Black Holes and the enemy of the game the Sea Urchin. Black Holes appear in the same place each time you play a stage and as you progress through the five stages their placement becomes more and more devious and infuriating. If Bubbles passes over a Black Hole she will be sucked into it and lose a life. The Sea Urchin come out of the Black Holes at the beginning of a stage and will prowl the map in search of Bubbles. If they catch sight of Bubbles they'll give chase and if touched by a Sea Urchin the player will lose a life. The Sea Urchin cannot pass through uncovered Gold Ingots, this can be used to the player's advantage if they want to either trap an enemy or escape their clutches. Bubbles is able to defeat the Sea Urchin by first stunning them with an electric shock wave (pressing either A or B) and then pushing them into an outer wall. 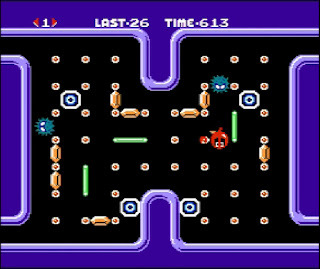 Defeating a Sea Urchin awards the player a big score bonus and grants a few seconds before more enemies emerge out of the Black Holes. 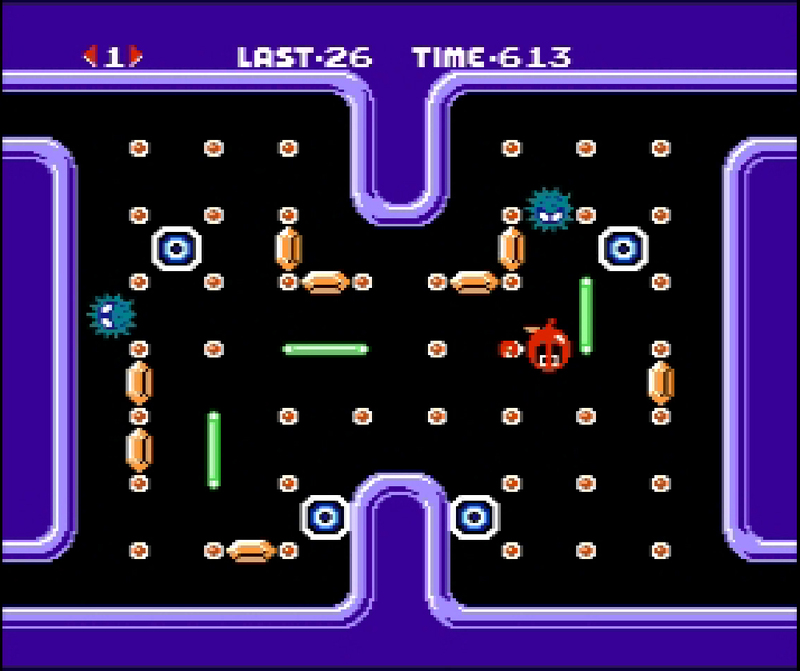 As the player progresses through the stages the speed of Bubbles and the Sea Urchins quickly increases to the point that the game becomes incredibly intense and stressful. Making it through the first run of five stages is an incredible achievement in and of itself. The challenge the game offers may put some people off but the game is incredibly addictive in short bursts and there is always a sense of progression through learning new gameplay techniques or memorising potential Gold Ingot locations. The game features a two-player mode which is the same as the one player mode but sees the two players fighting to uncover the most Gold Ingots. I imagine this could be a fun and competitive way to play the game - especially if played against someone of a similar skill level - but I have yet to try it out. The game does not feature any other modes or options which may put some people off but this was not uncommon for the time. 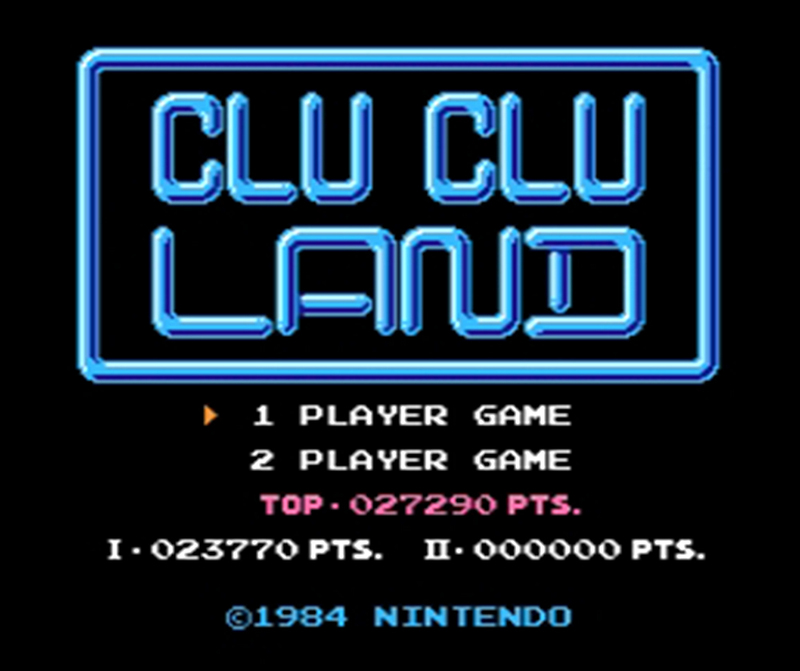 Clu Clu Land is a unique arcade style game with a great gameplay mechanic in swinging. It's easy to understand but incredibly hard to master, some may find little desire to get better at the game but I personally find the gameplay incredibly addictive, intense and above all fun. Trying to get a new high score is always enjoyable thanks to the high level of challenge, it can be frustrating at times but when you do finally beat your highscore you feel you've achieved something monumental. 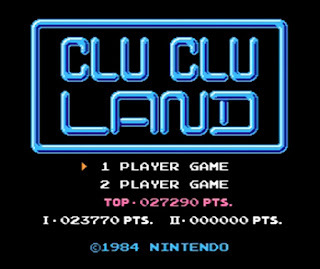 The game isn't perfect, with controls that take a while to get the hang of and a rather small number of stages yet there isn't much else like Clu Clu Land. The only way its legacy can be felt today is in a trophy in Super Smash Bros and through its spiritual successor for the GBA, DK King of Swing. It remains a curious title within Nintendo's back catalogue, one that is less than perfect but not be overlooked. End note: I played the game on the Nintendo 3DS via the Virtual Console which felt like a good fit for the arcade like gameplay. The game is also available for the GBA, Wii and Wii U.